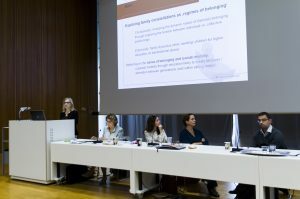 Ulla Berg (Rutgers University – New Brunswick) presented the concept of remote sensing to investigate how scattered families keep close contact and which modes of intimacy they apply to assure their belonging. Depicting the affective practices of kin work between the U.S. and Ecuador, she focused on the modes of affective communication shaped by mediatized relationships. Affects, Berg argues, act as a mediator of large scale economic projects like deportation that form an increasing part of everyday family-life in both destinations. Deportation constitutes an abrupt rupture of family constellations with single members being suddenly cut off from direct physical contact, the option to care for and support the family. Staying emotionally connected forms a key concern for the deportees and, consequently, remote sensing through enacting social relations by mediation becomes a central concern. Although the new media environment allows the deportees to achieve and maintain a certain degree of closeness, it cannot, however, substitute multisensory experiences, which in turn reinforce feelings of separation, alienation, and, in the case of male deportees, the diminishing of masculinities. After being deported back to Ecuador, the deportees usually have to cope with expectations from their families-left-behind and the community; these expectations include that they take efforts at re-migrating to the U.S. With deportation, the moral economy collapses as it challenges normative behaviors and evokes prolonged silences. As a consequence, family constellations are reshaped or relationships are cut because of the affective challenges that accompany facing the condition of immobility. As the social environment has strong emotional and economic interests in the functioning of migration logics, it is extremely important for those who are “left behind” to articulate their needs and make themselves eligible to be cared for and sustain belonging. 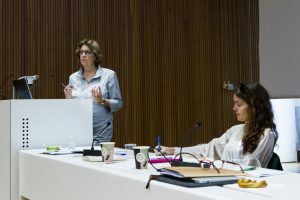 Transnational care practices and the social meaning of vulnerability were addressed in the talk by Heike Drotbohm (Johannes Gutenberg-Universität Mainz) who explored the burden of “doing intimacy” in kin constellations living divided. Drawing on fieldwork experience in Cape Verde, a “place made of and shaped by the presence of absence”, Drotbohm conceptualized the role of silence in transnational families as denominator of intimacies assuring belonging, complemented by a specific language of remembering. Silence, she argues, is a productive activity that reveals feeling- and display rules of transnational kin relations as it demarcates the inside and the outside of intimacy. 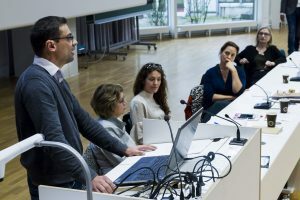 As transnational families have to deal with contingencies such as the gap between family members, fear of abandonment or unforeseen worries, silence can be seen as the “power of the weak” and as a critical response to feeling rules within a society in which migration forms a vital feature. Thus, the affective dimension of relatedness transgressed by migration is marked by the expectation that family members in Cape Verde sacrifice their individual needs to contribute to the well-being of the collective. Drotbohm concludes that silence works according to two registers: it affects upon the relations between individual family members and connects productive feeling states (like guilt or frustration) to a moral order. Moreover, silence can constitute a collective challenge expressing economic hardships or a “failure of absence” by implicitly muting absent members. Here, silence serves to cut off relations and to question the societal normativity. 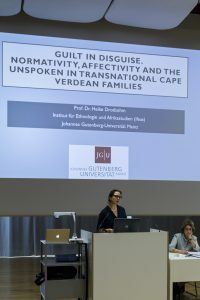 Furthermore, the plenary session took into account how local models of the family, of parenthood, care-giving, and attachment are reconfigured in contexts of migration, and how related ideals of the above mentioned concepts are contested and negotiated between family members. Performing educational desires was central in the talk of Joanna Pfaff-Czarnecka (Universität Bielefeld) who conceptualized family constellations as regimes of belonging in order to grasp the tensions between collective boundedness (parents) and individual freedom (children). The nexus of belonging, families, and (upward) social mobility was analyzed with regard to different modalities of belonging: firstly, through rules of commonality such as norms and emotions, and secondly, through rules of reciprocity such as mutual commitment or loyalty. Pfaff-Czarnecka paraphrased the challenges international students have to face while navigating university life in terms of “studying as parcours.” Forming a protected space for personal freedom, university involves multiple symbolic boundaries where diverse forms of personal development are in reach. Kinship, by contrast, is enacted through continuously and relationally negotiating norms, human behavior, and social interaction over the life course. Tensions between mobility and commonality change family constellations and challenge value systems. Consequently, multiple belongings can put a strain on time and energy of students balancing between rules of commonality and rules of reciprocity. When prospects and expectations of parents and children diverge, intergenerational “dramas” are enforced. Thus, families acting out regimes of belonging with an authoritative politic of inclusion and restricted space for negotiation, fail to connect educational with familial desires. As tensions often stay concealed, the “prize of belonging” diminishes as symbolic power. Gabriel Scheidecker (Freie Universität Berlin) approached the affective dimensions of transnational families with the topic of Negotiating Attachment through Food and Feeding in Vietnamese Berlin. Relating to the value of direct feeding as an established means of forming parent-child attachments in Vietnam, Scheidecker operationalized sensitive responses as a particular mode of affective practice. This highly embodied way of forming close relationships obviously becomes contested in Vietnamese Berlin, where different actors meet and different perspectives intersect – nurseries working in a German institution, parents socialized in Vietnam and their children who were born in Germany. As Scheidecker showed, young children rapidly adapted the non-direct mode of feeding as common in the nursery where they spend most of their time and where the practice of direct feeding was criticized by staff members. Consequently, the two different modes of feeding in the nursery and at home lead to the creation of affective dissonance between children and their parents enforcing the reconfiguration of kin relations. Whereas children tended to prefer the institutionalized practices, parents continued to prolong direct feeding as an expression of care and belonging according to their feeling rules and assured by a well-frequented transnational Vietnamese community, established through mediatized relations. The consequences of belonging include rearranging models of care-giving and attachment with contesting ideals to avoid tensions encouraging to experience an affective intergenerational dissonance from early years on. The plenary session ended with a vivid discussion in which the question of intergenerational as well as horizontal conflicts within a generation was raised, e.g., negotiating social mobility in relation to aspects of gender. Silence, again, acts as an operator in regimes of belonging, expressing a symbolic power. The prospect of the plenary session highlighted the impact of educational regimes potentially provoking an “integration-drama”. Thus, a critical reflection of the problems of (higher) education, family expectations and how they enforce or mitigate intergenerational affective dissonances should not be missing from future research addressing “Families on the Move”. During the conference, questions of the political, moral, and religious dimensions of belonging were elicited in various panels. With the closing session on affective dimensions of relatedness, the emphasis on affects playing a crucial role in social relations and determining the prize of belonging encourages further research. 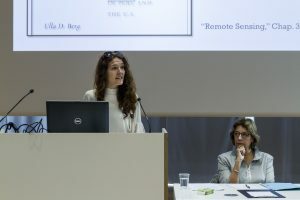 Edda Heyken ist wissenschaftliche Mitarbeiterin in dem anthropologisch-psychiatrischen Teilprojekt „Affektive Anstrengungen der Migration: Süd- und Nordvietnamesische Lebenswelten im geteilten und wiedervereinten Berlin“ des SFB „Affective Societies“.